Collins lived fully while battling a rare and aggressive cancerous brain tumor. His faith, strength and courage inspired those who loved him and even those that didn’t know him. 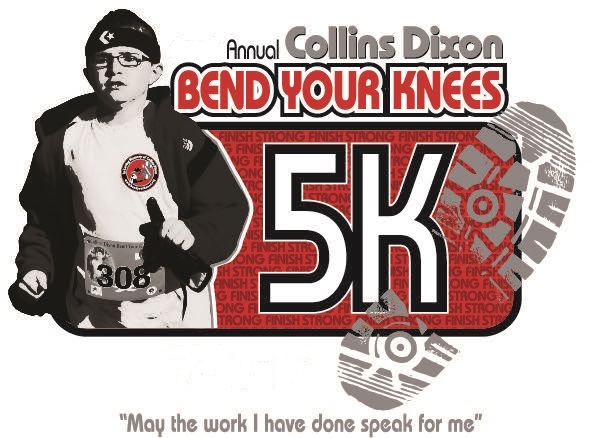 Please join us in honoring his life by running in the 5K at the First Baptist Church of Canton, GA, while bringing awareness to a disease that is the 2nd largest cause of death in our precious children. Let’s FINISH STRONG! for children battling Brain Tumors! Awards: $100 Cash Prize to Overall Male/Female Winners if they are adults (Cash will be given to Masters winners if youth are overall). Awards given for Masters Male/Female and top three in age groups 10 and under through 75 and over. Shirts and Goodies: Shirts are guaranteed to those who register by 7/4/16. Those registering after that date and on race day are not guaranteed a shirt or size. There will be plenty of refreshments. Timing and Results: Chip timing and results provided by Classic Race Services with results posted to www.classicraceservices.com, www.active.com, www.runningintheusa.com and www.coolrunning.com. Series Affiliation: The race is part of the 2016 Black Bag Race Series and the Clover Glove Series.